Little Author in the Big Woods: A Biography or Laura Ingalls Wilder provides children a fresh and new biography of a favorite author. In fact, continue reading for Big Sister's first book review. Yona Zeldis McDonough writes about the life of Laura with a clear voice. The book begins with a short prologue about Charles and Caroline Ingalls before she chronicles the life of Laura. In each of the chapter's subtitles, the years and states (or territory) the chapter discusses are listed. As one reads Little Author in the Big Woods, (affiliate link) they remember their favorite episodes and highlights of each of the Little House books. McDonough includes some additional facts about the real life of Laura Ingalls' growing up years. She continues where the Little House books leave off and tell about Laura's adult life. The illustrations are cute. At the conclusion of the biographical information, readers enjoy Laura's quotes, explanations of games Laura played, what Laura ate, and instructions to make a corn-husk doll. I would have liked more information that was not in the Little House books to be included. Since I've read a good bit about Laura's life through biographies (for adults and children), as I was reading I sometimes thought of facts that could have been included, but were not. It is a basic children's biography. Edited: Since this book was published more information has become available. There was at least one instance where the author took what was in the Little House books that had been fictionalized, but was presented as fact in this book. Big Sister, age 8, saw I was reading it and was quickly curious and asked to read it, too. This is her review of the book. I liked when they got the kitten (because I really like kittens). I liked almost everything. Laura was born in 1867. Mary got blinded (not because of sunlight) because of a sickness. All their lives, basically, they traveled through the Indian Territory, Dakota Territory, and more. Laura made lots of things in her life. They played games like Ante I Over, Pull Away, Prisoners’ Base. The book also explained how to make corn-husk dolls. I disliked death. First, Pa’s death. Then Ma’s. Then Mary’s. Then Grace’s. Then Carrie’s. And then, finally, three days after her 90th birthday, guess who? Laura. I recommend this book for girls, women, and for read alouds. 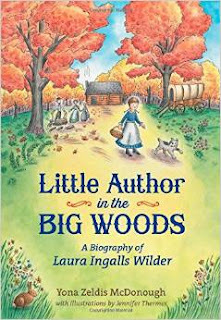 Have a good time reading this biography of Laura Ingalls Wilder.